I don’t mean to be indelicate, folks, but I think the time has come to talk about one of the other consequences of eating. As one of my children’s books puts it: “just about every animal poops.” If you’re the kind of person who gets easily offended, I will completely understand if you decide to stop right here and skip this post. Consider this your official “get out of poop free” card. 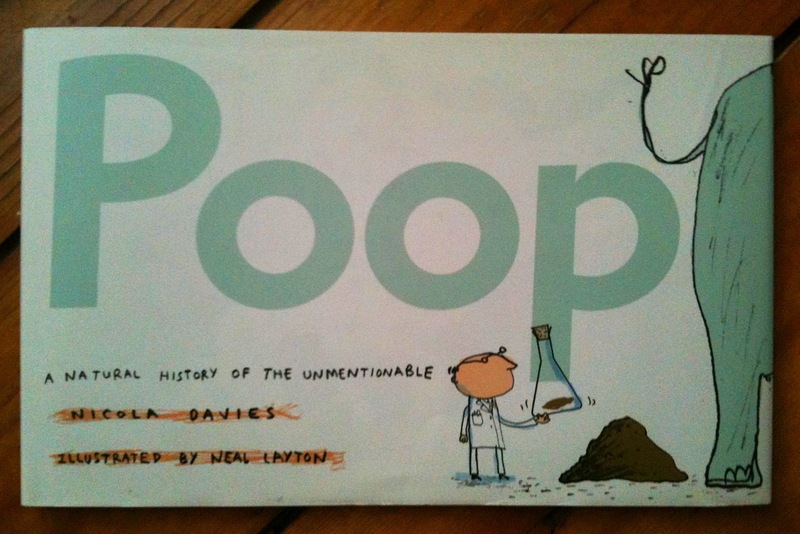 Quite honestly, I never used to give poop a lot of thought. It wasn’t until I first went to a local chiropractor for pregnant-lady-back-pain about ten years ago that I was given a reason to think about the issue as a matter of health, rather than mere inconvenience or necessity. “About how often do you have a bowel movement?” Ray asked me. Ray Foster is not only a wonderful chiropractor, but a neighbor and fellow parent. I was more than a little mortified to be asked such an unmentionable question, not to mention the fact that I really had no idea how to answer it. I had to admit- I really didn’t know. Certainly not every day, maybe every couple of days… heck, who knows? For all I knew it could’ve been once every month. Are we really supposed to keep track of such things, I wondered? Had I missed that day in health class? Since then I’ve paid the issue a bit more attention, realizing, of course, that what goes in can be as much an indicator of good health as (ahem) what comes out. For a solid two decades of my life I was what they call a “french fry vegetarian,” ie: just because you don’t eat meat, honey, doesn’t mean you’re eating healthy. In that space of time I enjoyed more than my share of all the non-meat items on the menu: cheese, bread, pasta, more cheese. Once in a blue moon I might eat a vegetable, just for the sheer novelty of it. At that rate, it’s probably lucky I didn’t just stop “emitting” altogether. I probably would’ve made it to my fiftieth birthday party and then, at the height of the festivities, exploded. But somehow the human body makes due with what it’s given, so to speak, and soldiers on. Which brings me back to the No Sugar Project. I’ve mentioned that, since being on the project since January first, I have not lost any weight, the kids don’t seem noticeably calmer, nor has my hair turned green or any other very obvious side effect. I do seem to feel healthier, and I seem to not get sick as often or for as long as I might otherwise- all subjective effects which could just as easily be due to coincidence or a placebo effect. However, one thing which is simply not subjective is poop, and I am a little embarrassed to report that- apparently- I am full of it. At first, I tried to ignore the obvious change, but the facts are as inescapable as they are mystifying to me: on our No Sugar Plan I don’t just “emit” like clockwork, I poop like a swiss freaking watch. At least once a day. If not more. What is going on here?, I’ve wondered. Is it the lack of sugar per se? Or could it be the fact that we’re eating so many more fruits to supplement sweetness in our diet? Could it simply be the fact that we’re making so many more things from scratch in order to avoid sugar, and in doing so are also avoiding a host of other food additives and preservatives? Hard to say. All I know is, we’re officially at the end of month three today, and my body is, well, working better than it has perhaps ever before, which is really, uh, nice. And probably a good sign of improved health. Not to be gross about it or anything. I was wondering about the weight loss, etc. I just finished a 50 day meat (except for sea creatures) fast. No weight change. I also had some blood work done to see what the effect would be on my triglycerides. I am vacationing right now (and obsessively reading about sugar! Thank you NY Times. ), so I haven’t seen the report. I am now thinking about an added sugar fast which I have tried before. It’s really fascinating and challenging to avoid typical American fare. I have been lucky health-wise my entire life; no major issues, weight is good, but I am over 45 and concerned about quality of life. As a mom too, I want to put my children on a healthier path. In our house, from the beginning, anything other than water or milk is a treat. Baked goods, processed foods and ice cream are occasional treats not nourishment. Vacation means all bets are off. I still remain virtually unchanged in weight, and am still totally surprised by that fact- all that prior guilt thinking that if I just cut down on desserts I’d lose that five pounds…? Well I’m glad I can let go of that! You are currently reading A Year Of No Sugar: Post 36 at Eve O. Schaub.